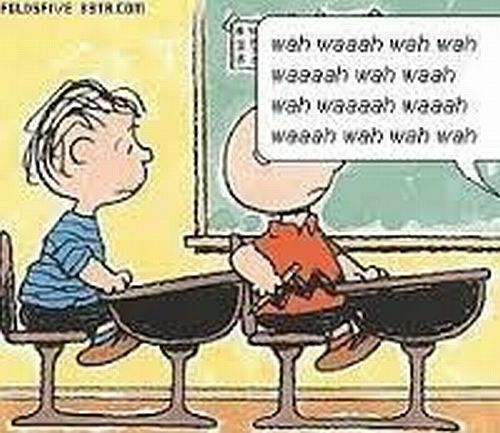 Was flipping through the channels recently and came across an old “Peanuts” episode. I decided to stop for a while and take a trip down memory lane. I have great childhood memories of the great pumpkin, the Charlie Brown Christmas, and even Lucy pulling the football away from poor Charlie Brown. I could kind of relate to that. As I was watching, something occurred to me that I never really stopped and thought about before. The kids can’t hear a word the adults are saying. Go back and rewatch and it will all come back to you. Any time an adult speaks it just comes out as white noise. Waaah, waaah, waaah, waaah, waaah. In thinking about this, I came to the realization that it’s not far from how a lot of kids hear the adults in their lives. Too often we talk at them instead of to them, and when we do so, the earflaps go up. Most adults I know have less than perfect listening skills, so it’s no wonder most kids haven’t fully developed theirs yet either. Kids want to talk about THEIR worlds, and simply expecting them to stop and pay attention when we want them to listen, is often an exercise in futility. Sure in a perfect world kids would respect their elders, listen when spoken to, and come the first time they are called. The only time I’ve ever really seen it work like that was in The Sound of Music. And that guy had a whistle. I think one of the secrets to getting kids to really hear us is to first model a sense of empathy by becoming interested in their lives, and really listening (not waiting to talk) about what they are trying to tell us. When we give children the purity of our attention, we demonstrate to them that they deserve respect and consideration, while also providing a model as to how they should treat others. When we raise our voices, lose our tempers, and physically punish, we are providing another kind of lesson about how to cope with conflict. I’ve sat with far too many adults who wake up one day and realize they have incorporated traits of their parents they swore they never would. The young mind is like a mirror, and it absorbs the prints of its handlers. Many parents may read something like this and disagree. They were raised to think children should obey, be seen and not heard, and be disciplined in the same ways they were as a child. And truthfully, I do believe most parents are doing the best they can with the information that is available to them. As a counselor I have sat with dozens of children who don’t listen to me, and I know it can be incredibly frustrating to feel you are simply spinning your wheels. Still, we must consider that children are a work in progress, and often haven’t fully grasped the concepts of listening, sharing, and empathy for another person’s time. We teach these things by living these things. That’s the way kids learn. By watching us. So next time you are having problems communicating with a child, consider taking some time to simply sit and listen. Not with advice, not with a life lesson, but instead with both compassion as well as patience. The WAY you listen to them is often just as powerful of a lesson as any kind of advice you have to dispense. I know I always consider it a victory when a child begins hearing what I say. 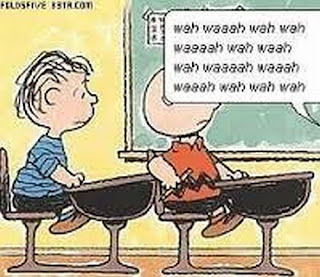 Too often I’ve been like the adults in Charlie Brown’s world. Waaah, waah, waaah, waah, waaah…..
For a long time it had seemed to me that life was about to begin – real life. But there was always some obstacle in the way, something to be gotten through first, some unfinished business, time still to be served, a debt to be paid. Then life would begin. At last it dawned on me that these obstacles were my life. Never forget that you must die; that death will come sooner than you expect... God has written the letters of death upon your hands. In the inside of your hands you will see the letters M.M. It means "Memento Mori" - remember you must die. Every August, usually right in the middle of the month I get a feeling. It’s a strange combination of melancholy, longing, and remembrance of things past. Maybe it’s because my birthday is at the end of the month. Or maybe it’s the memories of summer dwindling away and that pang of youthful remorse that you didn’t quite accomplish everything you set out to over the summer. That time was slipping away and life was about to speed up again. It’s not my favorite feeling. It was one of the most powerful things I’d ever seen. After asking around a little, I discovered this was a common theme a few hundred years ago. Memento Mori. Remember you must die. It was a reminder to people that in the face of disease, sickness, war, etc. that they were going to die. It was more than that though. It was also a reminder to live. In thinking about this idea, I also came to a better understanding of what my mid-August melancholy was all about. It wasn’t so much a desire to recreate the past, but instead a reminder to live. We only get so many summers and we need to make them count. Personally I used to measure a great summer by the places I’d traveled and the things that I had seen. That will always be important to me, but lately I’ve come to a deeper understanding. It’s not about the places, although that’s wonderful as far as it goes. It’s about the people. Our relationships and the connections we make along the way that create the hooks we hang our memories on. We need to learn to appreciate the good times while they’re actually happening. So I thought about my afternoon at the church all those years ago, and started to remember. In actuality I was traveling alone, a little worried, and a lot lonely. I spent the day in a little bar in the country and I talked to people. A Scottish man on a eurorail pass who made me laugh all day telling me stories about how they drink in Scotland. A Spanish girl who had been traveling alone after a breakup who eventually joined us in our conversation. The owners of the hotel I was staying at, who cooked us a little lunch when they saw we were quickly progressing to being overserved. People. People just like me who for an afternoon found themselves needing someone to talk to. So in thinking about the concept of Memento Mori, I think it’s not just about remembering that you must die, but also to remember that you must live. And the best way to do this is to continue to cultivate relationships and appreciate our fellow travelers here. Especially those closest to us. In the end, know one cares about how much money you made, or how many women you were with, or how many cars you owned. All those things are fleeting. Much like those corpses in front of the church who were once young and healthy and hopeful, we too will get sick and get old and start to decay. This will probably happen sooner than we think, and before we are ready. In the meantime we have a choice, every day and every moment to live a little more authentically. There are 20 more days in August. Maybe there’s still a little summer left..